I’m lucky to work for a good company who provides great facilities for cyclists including showers, towels and storage space for sweaty clothes. 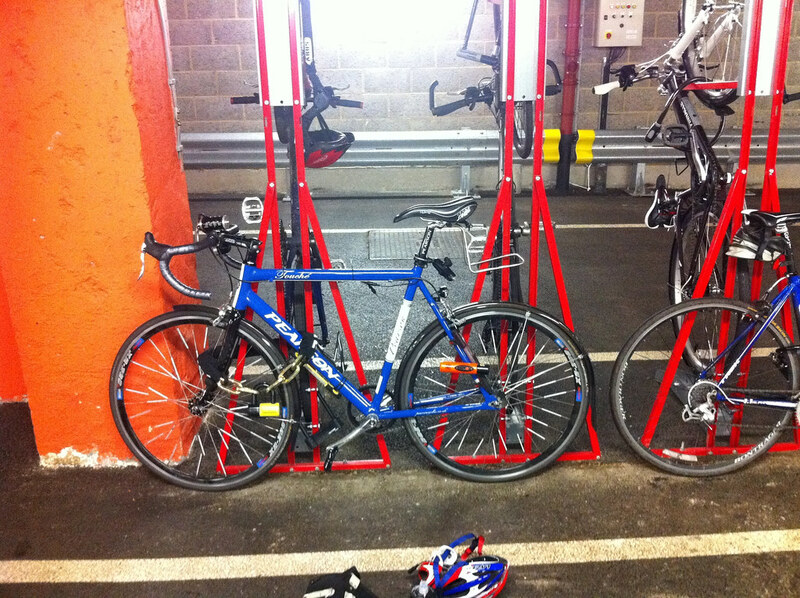 Oh I forgot, nearly 400 bicycle racks in the basement! 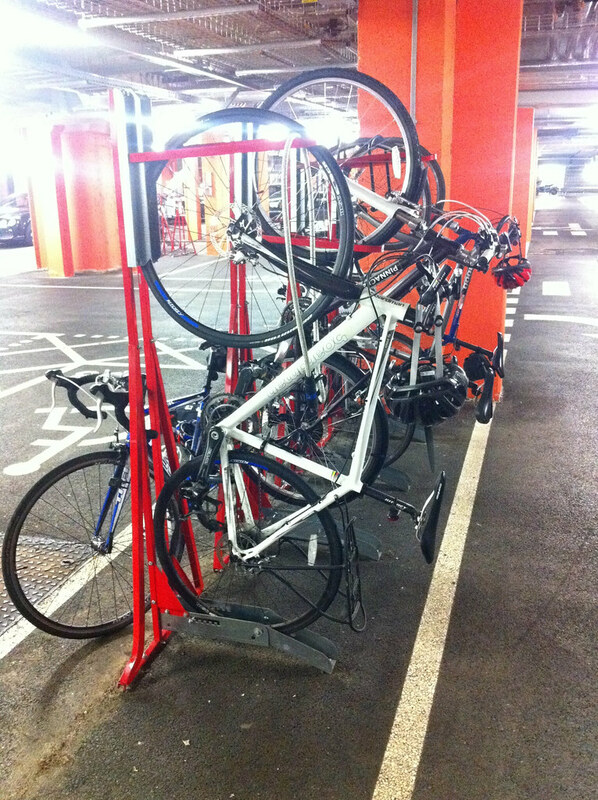 This means we have bicycle racks which store the bikes vertically and in some cases with the racks backing on to each other in a very tight fashion that makes moving a bicycle around rather difficult. I didn’t have a problem with the racks at first, I was using bikes with out mudguards but as I grew to dislike the dirt coloured stain in my arse area every time the ground was wet I quickly fitted mudguards on any bicycle I was regularly commuting on. This however causes a massive problem with using the bicycle racks provided, the contact points are on the rear wheel as the bike is vertical and a loop over the front wheel. This causes obvious problems with any bicycle that has near full length mudguards as the bicycle rests most of its weight on the mudguard. I’ve so far broken/damaged 3 mudguards when trying to put my bicycle into the racks, a few months ago I decided enough is enough, I’m going to stop using them and lock my bicycle in a normal fashion to the back of the stands. Locking it in such a fashion has a major advantage, no not that my mudguards no longer break but I can actually lock my bicycle securely by locking both wheels and the frame in two locations. This is not something that is possible if you use the racks as your frame is nowhere near the frame of the stand, even with a 1m chain I was unable to lock my frame to the stand. I didn’t have any trouble locking my bike in such a fashion for a few months, then it all got heated when people started leaving their bikes in an untidy fashion for weeks on end. It causes issues with people who move around the basement, it looks untidy and it blocks people from getting in and out of their motor vehicles. 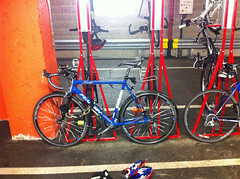 Recently e-mails have been sent to the facilities manager in the company I work for about such and that we shouldn’t be parking our bicycles in such a fashion. 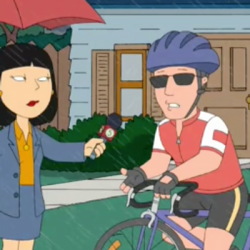 Obviously I quickly fired an e-mail back to him explaining the issues I have specifically about my bicycles getting damaged if I use the racks and he replied ‘I’ll raise it in the next building management meeting’. I’ve spoken to him several times since but nothing has happened yet. 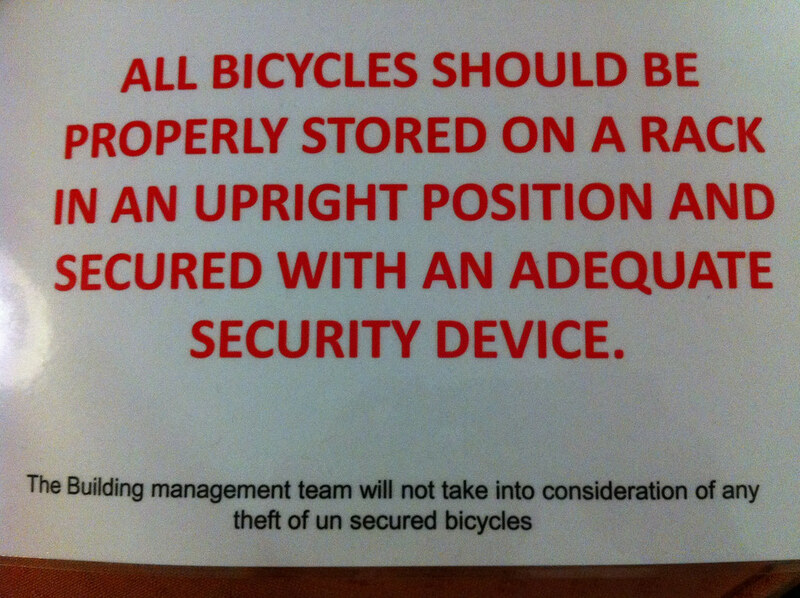 Last night I went to get my bike and I noticed a sign on it, from the building management. I guess I’ll have to apply more pressure to my facilities manager. 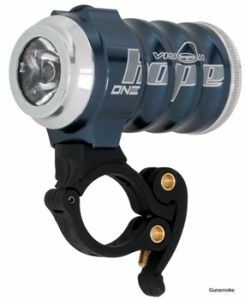 The Hope Vision 1 bicycle light is Hope’s bottom of the range bicycle light but don’t let that put you off. The CNC machined case makes the light full water proof and the Vision 1 puts out over 200 lumens from only four AA batteries, something not achieved by many other lights. The Vision 1 has 4 light modes, 1 flash and 3 steady ones. Making it a perfect commuting light, especially if you travel through multiple types of roads (lit vs unlit). The Hope Vision 1 is often praised by its quality, Hope certainly is traditionally british as the make good quality parts and offer a fantastic service. The whole product is well thought out and well designed. 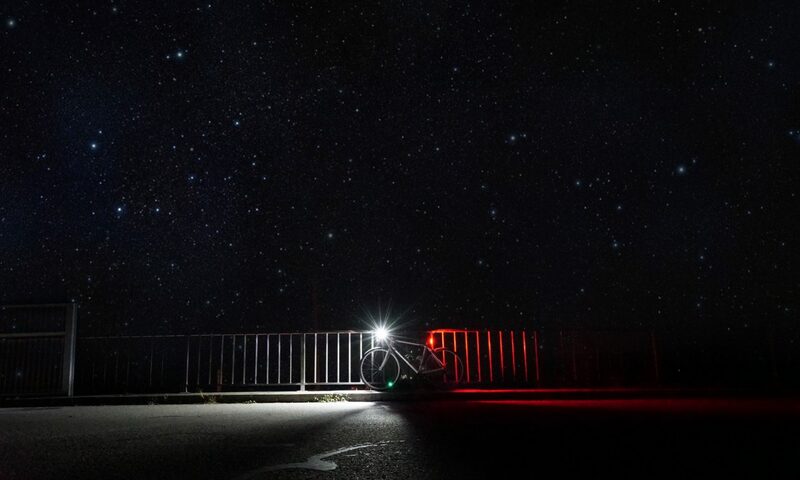 Due to the narrow beam a single Vision 1 is not enough for cycling off-road or on unlit roads at night-time in my opinion, two Vision 1’s are enough. Whilst the narrow beam does have that disadvantage, it has an advantage when using it in other traffic. Pointing the beam on the road in front of you means you don’t blind other road users, you light the road up in front of you and you are made visible! Something which crops up in other lights of similar target market is how you turn it off and change modes. 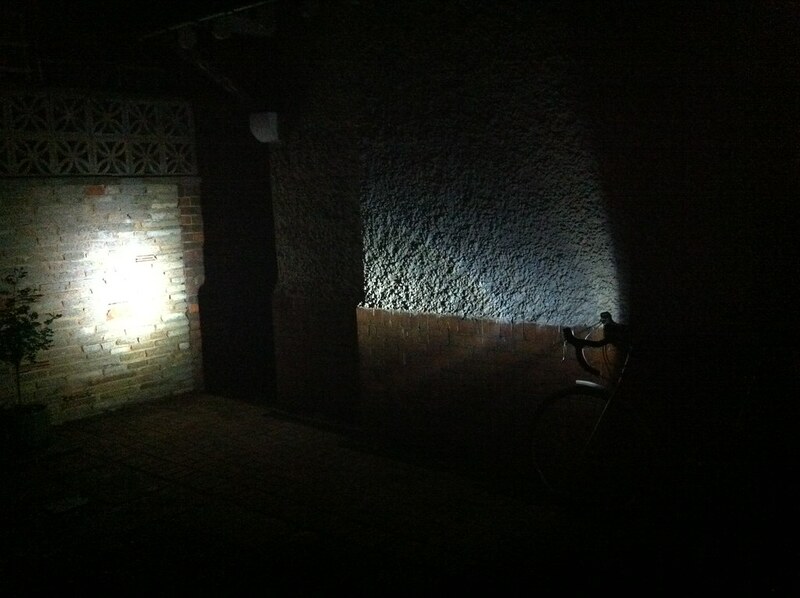 For a light which is used in the dark and potentially off-road it is important how it handles this. The Hope Vision one can only be turned off by the user if the battery is removed or if you hold the power button. Pressing the button cycles through the light modes and this is how it should be. Other models of lights have the off mode in the button cycle, which means if you want to change back to the first mode you must turn the light off first which either means crashing or stopping your ride. The only downside to using a light with 4x AA batteries is that the light really does chew through them, using regular Duracell batteries will be expensive and small capacity rechargeable batteries just don’t last long enough. High capacity rechargeable batteries are a good value purchase but you still need to work out a good recharging scheme so you don’t get caught out. At least you can rest in the fact that if you do run out of juice whilst on the road you can at least pop into a petrol station or corner shop and buy some batteries which will get you home, unlike the lights which use special battery packs. The major downside of the hope vision one is the lack of power indicator, it is one often brought up by people who have bought one and is a real problem with its hunger for battery power. You can get around it with good battery management but be warned, when the power levels get too low the light will suddenly switch off and you will only get a few more minutes on the lowest power setting. All in all it’s one of the best and brightest lights on the market for commuters, it’s at the higher end of the scale for most commuters but it’s reliability (as long as you manage the batteries) and power more than out weighs the price you have to pay, this light will last you years!